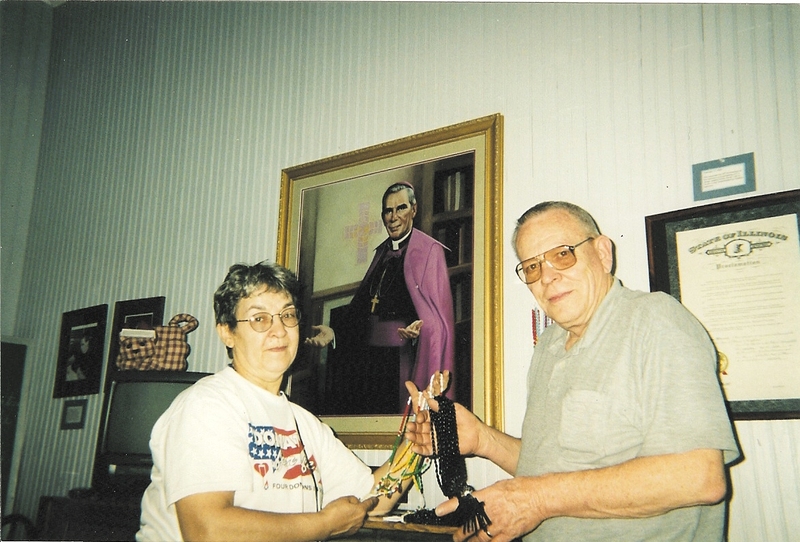 Carolyn and Wayne Bohy of Nebraska are pictured in the Archbishop Sheen Communication Room during a visit. Carolyn's spiritual mission and "treasure" for others are her handmade World Mission Rosaries designed by Bishop Fulton Sheen. Her heartfelt desire is to provide them to others, so they may begin praying daily, in addition to a silent Holy Hour. One of 16 children, she chose for her keepsake from her parents, their rosary. Bishop Sheen had given it to them on their 47th anniversary. The rosaries are blessed with Lourdes holy water. These rosaries are available for a love donation as are manufactured rosaries. Please read and be inspired by the address of Bishop Sheen delivered Feb. 11, 1951 as to why he designed this prayer tool. Gratitude for this article goes to Carolyn and the Propagation of Faith in Washington, D.C. If here is a heart in the audience that ever sent roses to a friend in token of affection, or ever received them as a sign of remembrance, he will not be alien to this story of prayer! Some deep instinct in humanity makes it link roses with joy. Pagan peoples crowned their statues with roses, as symbols of the offering of their own hearts. The faithful of the early Church substituted prayers for roses. In the days of the early martyrs---I say “early” because the Church has more martyrs today than it had in the first four centuries—as the young virgins marched over the sands of the Coliseum into the jaws of death, they clothes themselves in festive robes and wore on their heads a crown of roses, bedecked fittingly to meet the King of Kings in Whose Name they would die. The faithful at night would gather up their crowns of roses and say their prayers on them, one prayer for each rose. From its first days the Church asked its faithful t recite the one hundred and fifty Psalms of David. This custom still prevails among the priests, for we are obligated to recite some of these Psalms every day in what is called the Breviary. But it was not easy for anyone to memorize the 150 Psalms. Then, too, before the invention of printing, it was difficult to procure a book. That was why certain important books like the Bible had to be chained like telephone books, otherwise people would run off with them. Incidentally, this gave rise to the stupid lie that the Church would not allow anyone to read the Bible because to was chained. The fact is, it was chained so people could read it. The telephone book is chained, too, but it is more consulted than any book in modern civilization. The people who could not learn the 150 Psalms wanted to do something to make up for it. So they substituted 150 Hail Marys. They broke up these 150 decades, or series of ten. Each decade was to be said while meditating on the different aspects of the Life of Our Lord. St. Dominic who died in 1221 received from the Blessed Mother the command to preach and to popularize this devotion for the good of souls, conquest over evil and the prosperity of Holy Mother Church, and thus gave us the Rosary in its present form. It is objected that there is much repetition in the Rosary because the Lord’s Prayer and the Hail Mary are said so often; therefore it is monotonous. That reminds me of a woman who came to see me one evening after instructions. She said: “I would never become Catholic. You say the same words in the Rosary, over and over again, and anyone who repeats the same words is never sincere. I would never believe such a person and neither would God.” I asked her who the man was who was with her. She said it was her fiance. I asked, “Does he love you?” “He told me.” “What did he say?” He said, “I love you.” “But never before?” “He tells me every night.” I said, “Do not believe him.” He is repeating; he is not sincere.” The beautiful truth, there is no repetition in “I love you.” Because there is a new moment of time, another point in space, the words do not mean the same as before. Love is never monotonous in the uniformity in the uniformity of its expression. The mind is infinitely variable in its language, but the heart is not. The heart of man in the face of the woman he loves is too poor to translate the infinity of his affection into different words. So the heart takes but one expression, “I love you” and in saying it over and over again, it never repeats. It is the only real news in the universe. The beauty of the Rosary is that it is not only a vocal prayer. It is also a mental prayer. You have sometimes heard a dramatic presentation in which while the human voice was speaking, there was a background of beautiful music, giving force and dignity to the words. The Rosary is like that. While the prayer is being said, the heart is not hearing music But meditating on the Life of Christ, but applied to our own life and our own needs. As the wire holds the beads together, so meditation holds the prayers together. We often speak to people while our minds are thinking something else. But in the Rosary we do not only say prayers; We think Bethlehem, Galilee, Nazareth, Jerusalem, Golgotha, Calvary, Mount Olivet, Heaven---all these move before our mind’s eye as our lips pray. Peace will come only when the hearts of the world have changed. To do this we must pray, and not for ourselves, but for the world. The world means everyone. Our enemies and our next door neighbors. 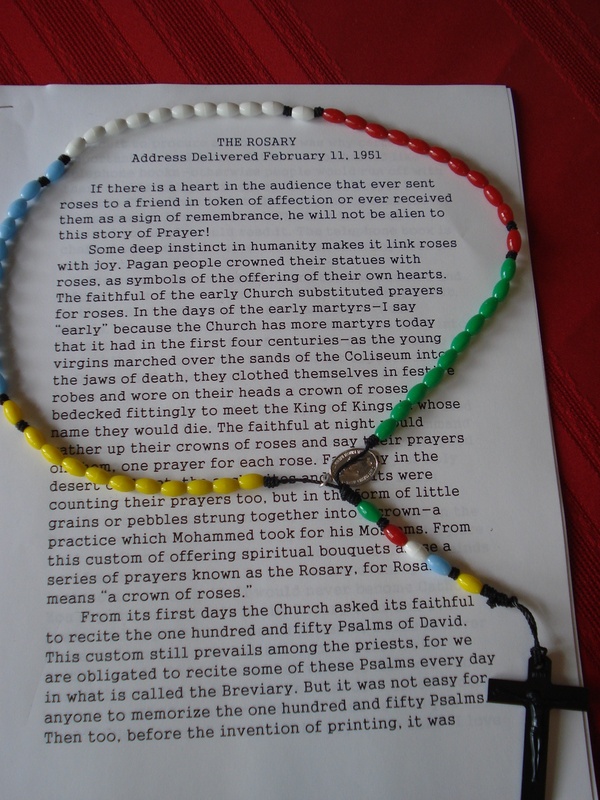 To this end, I have designed a Rosary called the World Mission Rosary. Each of the five decades is of a different color to represent each of the five continents or the world from the viewpoint of the Missions. One decade is green for Africa, because of its green forests and because it is the sacred color of the Moslems for whom we pray. The second decade is red for the continent of American which was founded by the Red Man. The third decade is white for the Continent of Europe, for its spiritual father is the White Shepherd of the Church. The fourth decade is blue for the Continent of Australia, Oceania and the other islands in the blue waters of the Pacific. The fifth is yellow for the continent of Asia, the land where the sun rises and the cradle of civilization. When the Rosary is completed, one has circumnavigated the globe and embraced all continents, all people in prayer. Our Rosary has this triple advantage. Each color reminds you of the part of the world for whom you offer the decade. 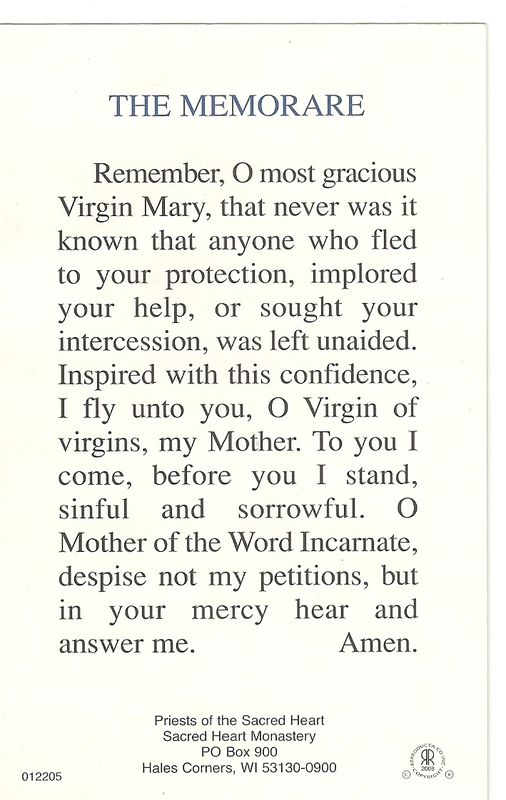 Secondly,, it fulfills Our Lady’s petition at Fatima to pray for world peace through the Rosary. Thirdly, it will aid the Holy Father and his Society for the Propagation of the Faith by supplying him with practical support, as well as prayers, for the poor distressed 600 mission territories of the world each of which is larger than New England. It all comes down to this: the world will change when we change. But we cannot change without prayer, and the power of the Rosary as a prayer is beyond description. Learn to sanctify all the idle moments of life. It can be done thanks to the Rosary. As you walk the streets, pray the Rosary in your hand or in your pocket. While sitting in traffic, while in a waiting room, or sitting on a train. All these moments can be sanctified and made to serve your inner peace. If you wish to convert anyone to the fullness of the knowledge of our Lord and His Mystical Body, teach him the Rosary. One of two things will happen. Either he will stop saying the Rosary, or he will get the gift of faith. For the love of Our Lord and His Blessed Mother won’t you please make a tour of the World on your World Mission Rosary. I know you will. Being such good friends of mine, I really ought to send you roses. Contributed by Fr. Andrew Apostoli, C.F.R. Devotion to the Blessed Virgin Mary was an ever-present grace in the life of Archbishop Fulton J. Sheen. Like the sun that sends its rays of light upon the earth from its rising to its setting, so the love of Our Lady shone like a bright light over the life of the future Archbishop, from its very beginning right through to its conclusion. It left an indelible impression on his life. This devotion began with his Baptism, at the very time his life in Christ began. He describes what happened in his autobiography: When I was baptized as an infant, my mother laid me on the altar of the Blessed Mother in St. Mary's Church, El Paso, Illinois, and consecrated me to her. As an infant may be very unconscious of a birthmark, so I was unconscious of the dedication but the mark was always there. Like a piece of iron to the magnet, I was drawn to her before I knew her, but never drawn to her without Christ. (Treasure in Clay, p. 316) We can judge how much this consecration to Our Lady meant to young Fulton from the fact that he spontaneously renewed it at the age of twelve when he received his First Holy Communion. His First Communion book contained a copy of the Litany of the Blessed Virgin, which he began to recite every night as a boy and kept the practice up to his death. Later on, when he was ordained a priest, he made a resolution to offer the Holy Sacrifice of the Mass every Saturday when the Liturgy permitted in honor of Our Lady. He saw it as a way to renew his love for her and to seek her powerful intercession. As he looked toward the end of his earthly life, he felt that his love and devotion to Our Lady would be an important part of his encounter with Christ at his final judgment. 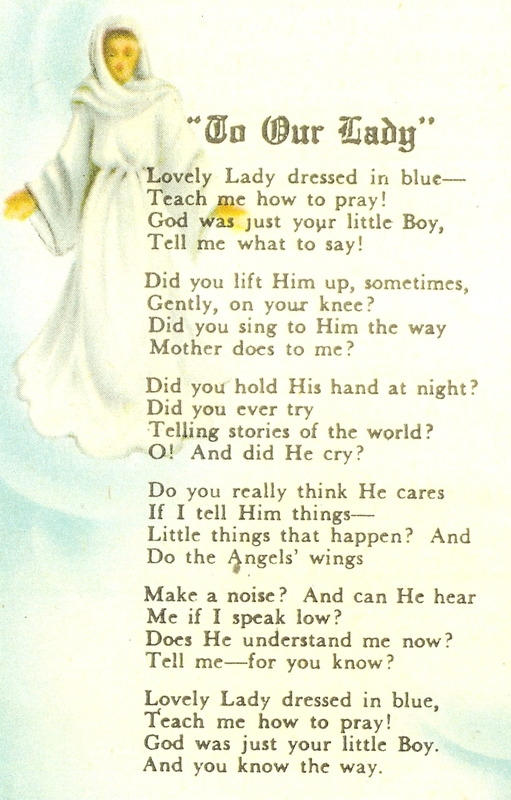 He felt Our Lord would say to him: "I know all about you; my Mother told me all about you!" Archbishop Sheen's filial love and trust in Our Lady is expressed very clearly in the motto he chose for his coat of arms as a bishop: "Da per Matrem me venire," "Grant that I may come to You through your Mother. "This devotion expressed itself in his visits to some of the greatest shrines of Our Lady, especially Lourdes and Fatima. He visited Lourdes over thirty times. He experienced many special signs of Our Lady's love and care for him there. On one such occasion, when he was without money, he stayed some ten days in a rather nice hotel. He asked Our Lady to send him someone to pay his hotel bill. On the tenth and final day, a man came up to him and asked if he would accompany him and his family on a tour of Paris. When the then Fr. Sheen agreed, the man added another question, "Have you paid your hotel bill yet? "The Archbishop made about ten visits to Our Lady's shrine in Fatima. Unlike Lourdes, where the place of the apparitions of Our Lady was the focus, at Fatima the message of Our Lady was stressed. She had come with a message of hope for world peace, as well as a plan from Heaven on how to obtain it. He saw four things in Fatima. First, he came to realize on the authority of Our Lady that Communism was an evil that was trying to conquer the world as it sought to destroy the Catholic Church. This conviction led him to be an unrelenting opponent of Communism in the West. His voice was often the only one to be heard opposing Communism because so many in the West did not see its dangers. He would often say, "We do not need a voice that's right when everybody else is right, but we need a voice that's right when everybody else is wrong. "Fatima impelled him to be that voice! Secondly, the Archbishop saw in Our Lady of Fatima a hope of converting the Muslim people. He held that Our Lady did not appear in the only place in Portugal with a Muslim name (Fatima was named after a Muslim princess who converted to the Catholic faith), simply to convert Russia. She came also for the conversion of the Moslem people because, as he believed, unless a great number of Muslims were converted, there would never be peace in the world. 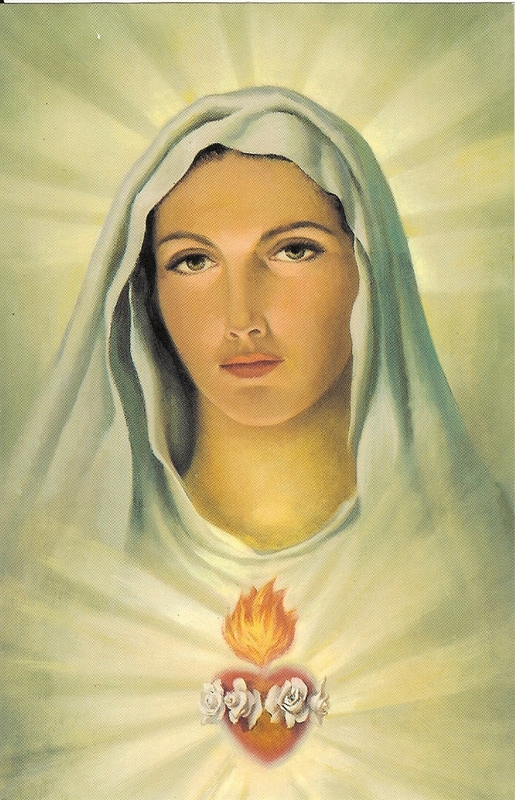 He said: I believe that the Blessed Virgin chose to be known as "Our Lady of Fatima" as a pledge and a sign of hope to the Muslim people, and as an assurance that they, who show her so much respect, will one day accept her Divine Son too!" Thirdly, Archbishop Sheen saw in Fatima a call to greater conversion of one's own life as well as a call to make reparation and intercession for the conversion of sinners. These themes conversion, reparation, intercession were central to the Archbishop's writings on the spiritual life. He called for constant conversion from the world to Christ. His famous comparisons of the Western world with the Communist world show this. For him, the West had Christ, but without the Cross no discipline, no self-denial, no mortification. He called this Western conception "a soft, effeminate Christ Who cannot save us!" In contrast, the Communist world had the Cross but without Christ's oppression, persecution, suffering. The Archbishop posed the question: "Will the West find the Cross before the East finds Christ?" Reparation and intercession were likewise important for every Christian because they are part of our baptismal co-redemptive mission with Christ so that, like St. Paul, we will fill up with the sufferings in our own bodies what is lacking in the sufferings of Christ for the sake of His Body, the Church (cf. Col. 1:24). He especially stressed reparation and intercession by priests. In his wonderful writings and talks on the priesthood, Archbishop Sheen would remind them constantly that they were called to be both "priests" and "victims" with Christ. This was part of their essential mission of saving souls. Fourth, Archbishop Sheen drew from the Fatima message the importance of the Rosary. Our Lady asked in each of her appearances: "Pray the Rosary every day!" She pointed out its power: "The Rosary can end wars! The Rosary can bring peace! The Rosary can convert sinners!" Archbishop Sheen loved the Rosary and prayed it daily from his childhood when his family would pray it together in the evenings. As National Director for the Society of the Propagation of the Faith, he would gather around all the workers (and any visitors who happened to be there) in his New York office at 3:00 p.m., and recite the Rosary. Most significant of all was his design of the World Mission Rosary. The Archbishop introduced this unique Rosary during his radio broadcast on "The Catholic Hour" on February 11, 1951, the Feast of Our Lady of Lourdes. Each of the five decades is of a different color to represent each of the five continents of the world from the viewpoint of the Missions. He said: "Our Rosary has this triple advantage. Each color reminds you of the part of the world for whom you offer the decade. Secondly, it fulfills Our Lady's petition at Fatima to pray for world peace through the Rosary. Thirdly, it will aid the Holy Father and (the work of) his Society for the Propagation of the Faith..." He concluded his broadcast: Thus in five decades, one covers two worlds: the spiritual world of either the Joyful, Sorrowful or Glorious Mysteries of Our Lord and the physical world of the five continents. May the Blessed Mother, who stood beneath the Cross on whose banner was written the three languages of the then known great civilizations of the world, now extend her help and mediation to the enlarged worlds of the five continents. The Archbishop was to sum up his reflections on our Blessed Mother in one of his greatest books, "The World's First Love." He divides the book into two parts. Part I is entitled: "The Woman the World Loves." Here he examines the life of Our Lady from her Immaculate Conception to her Assumption into Heaven. Part II is entitled: "The World the Woman Loves." Here the Archbishop shows how we need the Mother of God to help us deal with the problems and confused beliefs that confront mankind today. This book is truly a treasury of love, reverence and devotion to Our Blessed Mother. These words of Archbishop Fulton J. Sheen serve as a last pearl of great price from his pen: On dark nights we are grateful for the moon: when we see it shining we know there must be a sun. So, in this dark night of the world, when men turned their backs on Him Who is the Light of the World, we look to Mary to guide our feet while we await the sunrise. Fr. Andrew Apostoli is a member of the Franciscan Friars of the Renewal, a frequent guest on the EWTN television network, and the postulator for the cause of the Servant of God, Fulton J. Sheen.